I made a claim in my New Year's Eve's post that there were three concepts that were key steps to the Rule of Law, which if missed or denied, would saddle you with its Doppelganger, the Rule of Rules, instead. That post looked at the First Step as being the importance of Philosophy and emphasized the need to question the common assumptions that the Big Ideas of the West have little or nothing to do with everyday life. In the New Year's Day post we looked at the Second Step, how, through the ideas of men like Cicero and John Locke, The Law, in a general sense, functions as applied Philosophy. In this post we'll look at the Third Step, that the revolutionary concept of Property (as opposed to possessions), brings The Law into the very real interests, concerns and smallest details of our daily life - whether that's good or bad, depends upon how well the previous steps are taken. BTW, if you're a little uneasy about the "♫ ♪ ♬ it's as easy as 1,2,3...♬ ♪ ♫" nature of these three steps, good, you should be. We'll get into some of the Why's of that in the next post, but for today, first things first: Step Three, following the reality of our thoughts and actions in the world, and the vital connection between them, Property, the Biggest Ideas of the Big Thinkers of the West, and your ability to live your own life as you choose, and in society with others. Ultimately what it comes down to when we're talking about the importance of Property to our lives, can be looked at, believe it or not, as a recognition of the unity of cause and effect in human actions. ; and of the concept of Property as the recognition that, those effects which result from our actions having been taken, would not be as they are, in that way, in that context, without that person's time, decisions and actions having been contributed to it, and that involves that person's life in those effects which resulted from their having taken those actions. That unity of cause and effect is easily observable (whether or not they recognize it) in any people, of any time, and in any place, and it establishes the principle of a man's right, not just to, but in his property (Aristotle's recognition of four causes is better suited to this, but that's a whole 'nother post), rather simply the possession of it. More simply put, to see a clay pot is to know that it was caused to come to be - someone did build that. The pot is the effect of the potter's thoughts and actions; you get no pottery, the effect, without its cause, the Potter, and to take that pottery by force, is taking away what some portion of that person's life went into creating. it to every other person, to respect their rights as well. Because these principles are derived from observing the nature of being human, they are called Natural Laws - they aren't written by legislatures, but, as Lincoln noted, they are discoverable in the nature of the reality we all live in, as are the axioms and laws of geometry are - if we don't evade them, that is. A Just society is one whose own written laws recognize and uphold that Natural Law, and so secures to its individuals an inviolable lawful right to their property. If that society is consistent in its understanding and application of these principles, then as a consequence of the universal nature of these rights, it will be one where each person's Individual Rights will be upheld and defended, regardless of their national origin, race, gender, etc,. and that society is one where its people will be freed to be masters of their own lives, and will be able to engage in their own pursuit of happiness, while living in society with others who are at liberty to do the same. That is the truly revolutionary nature of the concept of Property, as opposed to simply possessing something by force, as a dog possesses a bone. The recognition that what results from a persons own thoughts and actions is what they have property in, secures to them not only those things which result from their efforts, but it's also the means of defending their ability to take those thoughts and actions necessary to human life - their Individual Rights. Property, far more than being merely a name for valuable 'stuff', is the material means of providing a secure and defensible anchor for every one of your Individual Rights in your own life, in society with others, which makes the defense of those rights into a vital interest of that entire society, through the Rule of Law. "...In the former sense, a man's land, or merchandize, or money is called his property. In a word, as a man is said to have a right to his property, he may be equally said to have a property in his rights..."
Recognizing the unity of cause and effect in human actions, means that there is a defensible legal claim by each person to what their actions result in - from essays, to songs, to the religion you practice, and the materials you created or purchased - and brings with it a necessary protection of your - and only after understanding this, can it truly be called: - Right to take those actions, whose result you have property in. Note: There are some nuances to this (and by that I don't mean things that need to be ignored or 'finessed', but situations which require paying careful, logical, attention to the chain of Cause and Effect), which we'll get to, two posts down the line. These concepts of Property and Individual Rights are the means of setting men free from the abusive exercise of arbitrary power, be it by Govt, employer or neighbor, because they connect the interests and powers of society at large, into defending each individual person's right to their Rights, and to their property in what results from their exercising them, and the only practical means that society has for accomplishing that defense, is through the Rule of Law, which is in turn rooted in Natural Law. "True law is right reason in agreement with nature; it summons to duty by its commands, and averts from wrongdoing by its prohibitions"
The development of this idea from its roots in the likes of Aristotle, Cicero, Locke and our Founding Fathers, was Progress such as the world had never seen, real progress on a scale that has transformed the entire world, and the world you see around you - the cleaner parts of it at any rate - more than simply Medicine and Technology, but our civil society, education, plentiful food and clothing, and on and on and on - these results were made possible because of the discovery and defense of Property and Individual Rights, under the Rule of Law. The Greco/Roman-Judeo/Christian culture of Western Civilization is the culture that first discovered these truths and principles, the first to discover that they are true, and that we can know them, and so should learn and abide by them. The first culture that learned how man can, not only live in liberty with their fellow man, but that he ought to do so, and that each person should be decent to each other while doing so (see courtesy, manners, etc. ), the first civilization to laudably desire Justice and a society infused with what is Good, Beautiful and True. Those are the truly Big Ideas of Western Civilization, and all that we have and have hoped to have, rests upon them, and upon our understanding of them, and - and I sincerely wish it wasn't necessary to say this - there is nothing in any of this that Westerners need to apologize for. Other cultures achieved many similar markers (see especially Confucian society), but all fell short of the mark. In this sense it is important to look, not at how we are similar to every other culture - and every society and culture on earth throughout history, has used every power available to them to violate and brutally abuse the lives and rights of their own peoples as well as any others they could manage to turn to their uses - but at how we are different from them, and we differ from them because of our discovery and commitment to those Big Ideas of the West. Only one culture in history has realized them, cared about them, and through our efforts to realize and implement them, the West has differentiated itself from every other culture on earth, providing the means to abolish the savagery inherent to the common societal baseline, and that is the culture of Western Civilization. On top of that, only one nation on earth is capable of, and has a long history of, welcoming any person of any nation or race into full citizenship with those born there, on the basis of their simply learning, accepting and embracing these crowning ideas of Western Civilization, and that is the United States of America. Thank you's are not necessary, but insults should not be tolerated, let alone encouraged. Locke's pen, and those preceding ideas he drew ink from, dealt the Doppelganger a potentially mortal wound, and the founding of America compounded it (and not for a moment has its supporters forgotten that). In that sense it is important to see that the battles over Property were not, and are not, about financial or political interests - though those certainly are some of the major fields of battle - but philosophical ones; it's not about your possessions - every people and tribe on earth have those - or even about prosperity - many cultures have achieved some or much of that - but about the rights that are integral to all of our lives, it is about whether individuals are to have natural power over their own lives, or whether the more unnaturally powerful may abuse them for the benefit of their lives. We've noted how those of America's Founding era didn't have the luxury of viewing Individual Rights, Property Rights and the Laws which they knew to be much more than mere rules, as things which someone deserved to be given them - there were no patrons to be courted and flattered into bestowing them. The nearness of that natural wilderness gave them a perspective on Locke's particular understanding of Natural Law, that the mother country took less seriously, but in America it was well understood that in order to live, Locke's ideas of Individual Rights were and had to be, their everyday realities. Such ideas as these could not have survived if thought of as merely 'Glittering Generalities', and though today we do have the technologies and bureaucracies to make it seem (Ponzi like), as if we were distanced from reality, the leveling spirit of that image is no less detrimental to all of our lives, and to our pursuit of Happiness. One way in which the Doppelganger transforms our vision of ourselves and the ideas which made our society possible, into being regarded as a society of empty materialism, is to claim a 'right!' to things you'd like and expect to be provided with. This seeks nothing less than the reversal of cause and effect, and in the process it eliminates the concept of a Right as being those actions which you are at liberty to perform by the nature of being human, and replaces it with an expectation (which is Passive/Aggressive lingo for a Demand/Command) that some hapless others must 'somehow' perform those actions whose effects you desire, which will 'somehow' (meaning taken possession of by force) be provided to you. Seeing this as desirable, requires seeing Govt as the great repository and provider of 'somehow'. Giving into this urge requires abandoning your link to reality, blinding you to that vision which makes it possible to derive those principles of Individual Rights and Property from, and eventually all of those benefits which they provided to you, will vanish. That is also Cause and Effect. That is the leveling force of the Doppelganger's gaze. Sharing its vision requires you to passively see what you desire as having been somehow done for you. To claim a right to be provided through, say, ObamaCare, requires you to limit your vision to seeing only your wounds as 'somehow' healed, your illness as 'somehow' cured - and it requires you to ignore the existence, or at least the common humanity, of the Doctor, the nurse, their staff, and to 'somehow' ignore all of their rights to make their own judgments and choices necessary to their living their own lives, in order to fulfill your desire to be provided the'right' you've demanded. Are you willing to see what that is doing? This supposedly benevolent 'right', requires that the interests and needs of others in society be ignored and dissolved, it IS the means of dis-integrating and dismantling that society which only living together in liberty, under the Rule of Law, had been able to create. That is a monstrous act of mental and spiritual brutality. Excluding some people from the protections that should be extended to all peoples by virtue of being people, means the shattering of the universal nature of individual rights, and it means that not only they, but you too, have NO rights any longer - only prizes and incentives, to be awarded by, and favors to be begged for, from a select few, who, as a consequence of their possessing enough (how much is enough?) political power over others, will subdue one acceptably reviled 'they' or another, to their will... or those parasites who are able to call on the favor of those who have that power, in return for a 'favor' for themselves. In case you missed it, what that really means, is treating people, all people, not as intelligent human beings with rights, values and aspirations of their own which must be respected, but as things, useful material meats whose artificial intelligence and physical requirements to exist are to be forced to conform to the desires of those with the power to expect them to conform - 'somehow'. It is pure savagery, and that is what life back at the primitive societal baseline, that lowest level of subsistence which Civilization is supposed to lift us up above, is all about. Instead of rising under the power of the West's Big Ideas, these 'protesters', political hacks and 'Social Justice Warriors' are demanding the use of brute force to thrust us back down into the primeval muck of being nothing more the useful human things, which they claim to have an unnaturalizing power over. I wouldn't doubt that you are now thinking of America's involvement with slavery, am I right? Ask yourself this: are you thinking of the thing itself and blaming America for it, or are you seeing those ideas which America first embodied, and which in historically short order, had enabled its eradication? Those who want to castigate and condemn America as hypocrites for their involvement with slavery are not only missing the point - often deliberately - but they have it entirely backwards. It was because of these new understandings of the nature of Individual Rights and Property that were becoming so familiar to the understanding of all Americans, that they came to realize what a horror the institution of slavery actually was. It was that new understanding which was the reason why, for the first time in all of human history, that the institution of slavery itself came to be seen as an abomination, as a curse, and that it was not just undesirable, but morally wrong and repugnant to enslave another human being, as well as being a threat to their own Rights as well. It was due to Americans deepening understanding of the meaning and implications of Property and Individual Rights upon the Rule of Law, that the eradication of the institution of slavery became a compelling necessity to a growing number of Americans, and the South's refusal to acknowledge the depth and implications of that truth, was the reason why our later Civil War would become an unavoidable tragedy. It was because slavery was recognized to be such a horror here, before anywhere else on earth, that it began to be banished - by those who were still fully in possession of the power needed to enslave those that they chose to set free. That last point can't be emphasized enough, the truly remarkable fact about slavery in America, is not that it existed here - there was no place or time in all of human history that it did not exist - but that it was very nearly eradicated here on the strength of an idea alone! Why is that not the more common reaction to the history of slavery in America? Slavery began to be eliminated in most northern states with that deepening understanding of Individual Rights and Property which brought on the Revolutionary war, and most of those northern states, who weren't as deeply entangled in it as those in the South, had abolished the institution before our Federal Constitution was even adopted, simply because people came to understand, for the first time in world history (with the possible, partial, exception of Epaminondas), that slavery was morally and ethically wrong. The 'peculiar institution' persisted in the South only by means of Southerners convincing themselves that, on the basis of the shallowest of appearances alone ('for the greater good! '), that blacks were somehow not the same as whites. How often in this series of posts have we seen that judgments made in the deadly shallows of appearances, when combined with our baser interests, provides the breeding ground for the Doppelganger to thrive! Contrary to the charge that America's Founders indulged in 'glittering generalities', the philosophical and rhetorical flourishes of the Declaration of Independence and our Constitution, were not examples of Americans going into flights of fancy, but the result of our having faced up to hard truths, and of performing arduous proofs of them by the application of reality to those ideas, and by verifying the hard way that those errors and shortcomings in the old ways of thinking did exist, and by doing so, they were able to discover the truths of the newer developments of the West's oldest ideas, because they were true. Again, it is a waste of time to wonder about and harp upon slavery being embraced in America's past - it was everywhere the same! - better for your life to consider Why it was eradicated, and why here, and why did that begin here before anywhere else? And the answer most worth paying attention to, is that because of the ideals of late 18th century America, which developed John Locke's concepts of Individual Rights and Property Rights, within the culture that respected and revered the highest and biggest ideas of Western Civilization, and because of all three of those steps (Philosophy, Rule of Law, Property) had been stepped up to, we are (still) benefiting from the (now ailing) Rule of Law, and so we are still able to live our own lives (within the barbarous constraints of modern Pro-Regressive programs), secure in your individual rights (if you're one of those #SomeLivesMatter) and property rights (unless some govt agency or functionary covets your property), and free from the threat of enslavement (unless you are in the medical profession, insurance profession, a home-schooler, a gun owner, etc.) by those desiring (and striving for the political power) to freely exercise arbitrary power over every aspect of our lives. And We The People's lack of understanding and regard for the concepts that eliminated slavery here, are now beckoning it to return, albeit while wearing a more fashionable set of clothes. As I said near the opening of this post, that unity of cause and effect which is easily observable (whether or not they recognize it) in any people, of any time, and in any place, establishes the principle of a man's right, not just to, but in, his property - why was it only in the West that it was recognized? And why so late in history as the 1600's? And why was it taken more seriously in America than anywhere else? The answers to that could fill a library, but to just fill out this paragraph, it's enough to note that it only happened in the West because only the West had the necessary Big Ideas to build upon and develop the concepts from, and the liberties we once held dear, and every aspect of our lives still remain, even today, dependent upon those ideas remaining within the conscious understanding of We The People - our lives have been built upon them, and they most definitely still depend upon them. 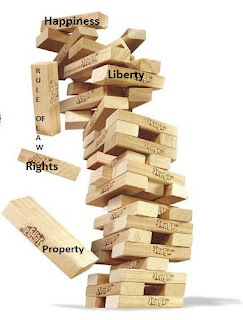 The game of Philosophical Jenga that Pro-Regressive thinkers have been goading us into playing, forgetting this idea, discarding that concept, will eventually end up as every game of Jenga does - in the structure's total collapse. The West's Big Ideas touch upon and affect the very smallest details of our everyday lives, and their continuance depends upon our having an understanding of Individual Rights and Property Rights and upon our realizing how important their being upheld under the Rule of Law is to every aspect of our lives. Far from being 'glittering generalities', these principles are truly golden practicalities, and they are vital to every action you might choose to choose in your life, from your ability to choose the food you want to eat, to the decorations you can put on your wall, to your being able to speak and associate with those you choose to, to your chosen profession and your ability to raise your children - and to preventing those with wealth and power from abusing anyone's Individual Rights, Property and lives because they have the inclination, wealth and power to do so and get away with it. Only the understanding of these concepts, and the insistence that they be upheld by the Rule of Law, can hope to keep your life, yours to live. Which brings us to the caution I gave at the opening of this post, that you should be uneasy about the "♫ ♪ ♬ it's as easy as 1,2,3...♬ ♪ ♫" nature of these three steps to the Rule of Law that I've given. Good. It takes more than what your reason might tell you is needed, and this may come as a surprise to some, but reason alone wasn't why or how our understanding of the Rule of Law was first accomplished. It required Pens mightier than Swords, and Paper reinforced with sound words and stout hearts, to enable it to withstand those great stresses that brought even castle walls tumbling down around them. A closer look at that, in the next post in this series. No despair over the State of the Union - how sad.